A Red Orchid Theatre presents the Chicago Premiere of ACCIDENTALLY, LIKE A MARTYR. In A Red Orchid’s intimate theatre space, Set Designer John Holt has impressively constructed a fully-functional bar. The long-curvy bar fills the stage and blurs the lines between reality and fiction. The twinkly Christmas lights, the stacks of longneck cases, the juke box; all the details make the experience that much more familiar. Are we in a bar? Or are we in a theatre? The illusion continues throughout the show. Is this art imitating life? Or life imitating art? It feels real to me. I have to bite my tongue to keep from inserting my opinion into the conversation or buying a round of drinks as the all-knowing-fag- hag-in-the-corner. Playwright Grant James Vargas has penned a darkly, beautiful tale about a community built out of necessity. 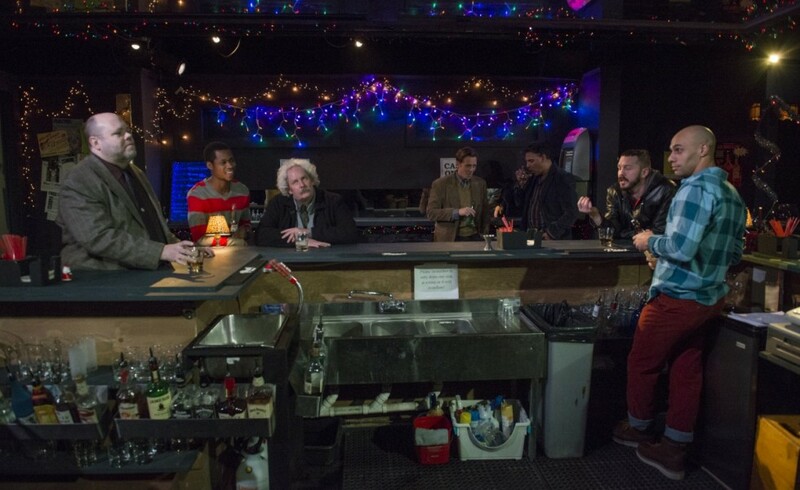 Vargas sets his story in a gay dive bar. Although there is a newer, hipper, younger crowd at the club down the street, the regulars choose to frequent this comfortable haunt. Vargas’ characters are palpably human. They drink, snort, and berate way too much. They are more like war buddies than friends. They’ve survived the hostilities of an anti-homosexual world for decades or just the day. The bar serves as their foxhole. They come to escape the ravages of war, lick their wounds and be themselves. Director Shade Murray has a reputation of actualizing the laugh even within the direst situations. He has the comedic touch. And this show is another example of the power of Murray. Within the drama, he has his sublime crew of misfits play to the humor. At one point Steve Haggard is drunkenly lamenting about serious concerns while he unexpectedly starts to remove his clothes; suit jacket, vest,…. Haggard doesn’t miss a beat in his stripping rant. It’s hysterical! Layne Manzer (Brendan) is continuously doing the high-spirited jig of the amped. The tireless Manzer is in a guy’s face, in someone’s personal space or in the bathroom. His shitfaced and often clueless antics are funny-drunk-guy perfect. On the other side of the spectrum is Doug Vickers (Charles) holding court from his stool. Vickers, a haughtier version of Cheer’s Frasier, orders his grasshopper or scotch between well-placed jabs dripping with pretention. Behind all the shots, both the liquor and the barbs, there is community. The bar is a place where these men grieve the loss of love, opportunity, time. It’s their oasis to drink it in; literally and philosophically. Their fellowship is sustenance. The soda-swilling sage Troy West (Edmund) asks Worsley if he’ll close early. Worsley responds that he would not want to disappoint his late night regulars. Worsley projects all the things we’re looking for in a favorite bartender: consistency, kindness and forgiveness. One of the things I was most looking forward to in this play was the appearance of David Cerda (Scott). I’ve watched Cerda lampoon on his own Hell in a Handbag stage many times. And he does it often in a dress, heels and imitating his idol Joan Crawford. I wanted to see how he fared on someone else’s stage. At Red Orchid, Cerda plays it straight… well gay but still. He is terrific in a dramatic male role. He charms as a bar regular and the object of conflicting affection. I highly recommend ACCIDENTALLY, LIKE A MARTYR. The story is so authentically engaging that you might want to stay until close and meet Worsley’s late night crowd. I know I wouldn’t mind hanging out at this bar again. Here’s to a long run… I’ll drink to that!